I know it's fairly quiet on here these days so not expecting a mass rush of responses, but has anyone tried this new URG latex from Adidas? The last few pairs of Adidas I have used (all the Predator range from December 2017 - October 2018) the latex used on them was absolute crap if I am honest, gripped for a game then died. Is there a huge upgrade with this new latex whether the 1.0 or 2.0 versions? From what I've heard the grip on them is surreal, even better then the latex on the predator gloves, BUT the durability is meant to be a lot worse if that is even possible? I think it's a latex that will only be benefiting professionals who are only using them for 1 or 2 games before relegating them to training gloves. I thought the grip on the Predator gloves was crap. A vast step down from the previous Ace Trans models. I've never worn them personally, but heard they were good for the first use or two. Not a lot online about the URG latex yet. One video from Sherlock Gloves I think the guy who tested them (The 2.0 rather than the 1.0 latex), said the grip is phenomenal in the dry, but almost useless in the wet. Was my birthday yesterday so decided to treat myself to a pair. 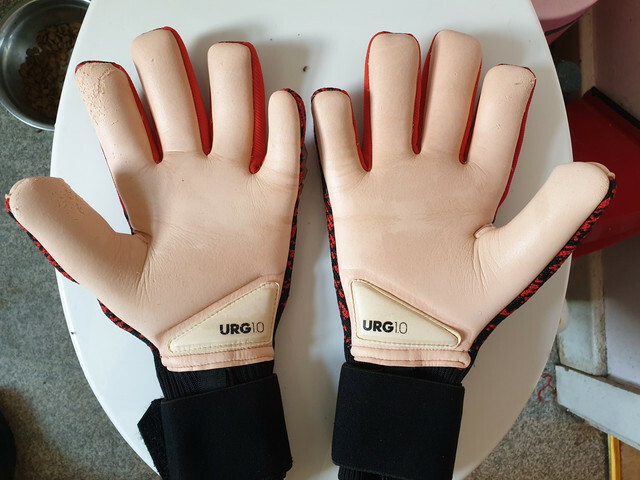 Went with the URG 1.0, thought if I am going to try them I might as well try the latex allegedly the Pros wear, so I shall feed back my thoughts on them. I know Alberto Ruiz is also going to try them out so if anyone is even vaguely interested in them keep an eye out on his ARS YouTube channel, he will put them through much more rigorous testing than I will I am sure. Just before I came out for my Thursday night kick about I decided to pre wash these for Sunday. Managed to nick a couple of bits of latex taking the plastic film off. The latex is SO soft. No idea what the URG 2.0 is like but the 1.0 is crazy soft. Pre washing them it felt when rubbing the latex like it would melt in my hands. Also from the packet the latex literally sticks solid to its self, never seen anything like it to be honest, even after a wash they are extremely tacky. I know you aren't supposed to anyway but you really would not want to store these palms together, I could see some people destroying their gloves if they do, pull them apart too quick and you almost certainly will rip apart the palm latex. The fit feels a bit better too. I thought on the 2018 Predator Gloves they had quite a pinchy sensation on them, these are slightly more roomy, very much like the old 2012/13 Predator Pro gloves (which I loved btw!). You reckon they are worth the money Bucks? I'm debating whether to get a pair. I haven't tried them yet so a bit hard to really say. I'd definitely say they have upped their game grip wise though, the Predator ranges since they came back the end of 2017 was absolutely awful, no idea what Adidas done to the latex to be honest but it was barely above Sondico £4.99 Sports Direct level. These straight out the box (they come in a box not a packet weirdly! ), are super super tacky, I literally feel like I could probably catch a ball one handed in these and not even blink. I heard rumblings on Social Media which I think was alluding to adidas, is that these companies use special additives and solutions (Similar to glove glu I guess) on the top layer of the latex to give the impression of this mega tacky latex that can hold anything, yet drops off after a few games and is then nigh on useless. The story makes sense with adidas IMO. I always prefer a high end giga grip for that reason, not the most tacky, but is always solid and dependable. I have heard this before although in general down the years with Adidas it hasn't been a major issue, although as I say the 2018 gloves were poor. Only one way to find out if these drop off or not I guess is to use them. They do feel extremely soft though, softest latex I have probably ever touched. A person who isn't welcome on GT anymore but is quite renowned in the Glove world did tell me that specifically Nike and Uhlsport add a chemical to their gloves that makes them super tacky for about 5 wears then the grip fades dramatically. That would make sense with Nike, their retail VG3 models suffer from that. Great out the bag and for a few uses, then become terrible. Havent noticed it with Uhlsport, but I will say. Their 'Supergrip' is anything but, unless it's perfectly dry they don't grip at all. Trying to catch a wet or muddy ball is seriously hard work in them. I would like to try the new Reusch G3 Fusion grip. But I cant bring myself to pay nigh on 100 quid for a pair of gloves. I've used Supergrip once. On a damp muddy, sandy pitch. And as soon as I dived on the floor and the gloves got dirty they were virtually useless. I actually changed gloves at half time in that game to a pair of Absolutgrips. I don't use the retail VG3s as they are just absolute crap. The promos ARE better. But both pairs I have had the grip is literally phenomenal for 4 or 5 wears and then becomes distinctly average. Not used the Reusch G3 Fusion, but I have used the G3 and I really like it. Was contemplating wearing them this Sunday before I bought the Adidas gloves. I really want to try the new Reusch range as they looked to have really stepped up their game in the last year or so! I got my Reusch in the sale. Sizing is a bit odd but they are nice gloves, well made. The latex feels really good. When damp it feels quite slick when you rub the palms together, but as soon as the ball hits it, they grip superbly well. Best Adidas grip I have used in probably 5 years or so. The improved fit it also a huge plus to be honest, not quite as tight as before. Just a shame I played like a bit of a mug in them today, no tearing on the palms as yet but I didn't really have anything to dive for today to be honest. You reckon these are worth the money Bucks? I don't mind lack of durability. Just for grip. Grip wise they are bloody fantastic. Given the URG 2.0 are also £100 I would probably say on that basis they are worth it. If the 2.0 were say £75 I'd probably say no.